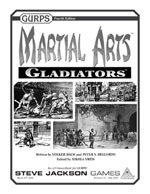 This list offers especially useful reference material and inspirational media for those who want to use gladiators in campaigns. This is not an exhaustive list, but it's a great start for more detail on the subject. Connolly, Peter. Colosseum: Rome's Arena of Death (BBC Books, 2003). A look at the inner workings of the Flavian Amphitheater from a technical point of view by one of the foremost experts on archeological reconstruction. Written for nonscholarly readers and beautifully illustrated. Ewigleben, Cornelia, and Köhne, Eckart. Gladiators and Caesars: The Power of Spectacle in Ancient Rome (University of California Press, 2000). This exhibition catalogue places the gladiator in his context of the Roman world of entertainment. Renowned scholar and reenactor Marcus Junkelmann wrote the excellent chapter Familia Gladiatoria. Futtrell, Alison. A Sourcebook on the Roman Games (Blackwell, 2006). 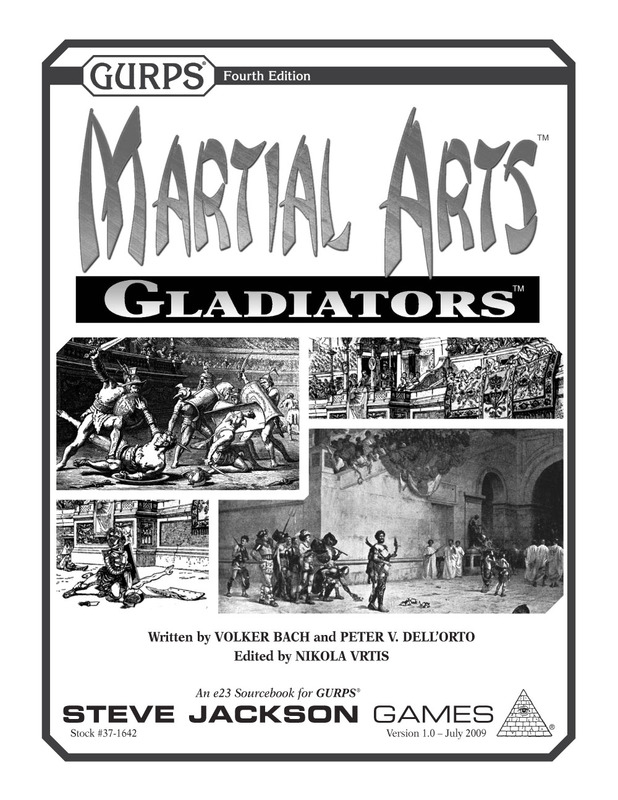 This scholarly reference book collects quotes from ancient sources on all forms of Roman games, including gladiatorial combat. Meijer, Fik. Gladiator: History's Most Deadly Sport (Dunne Books, 2005). This Dutch expert on the entertainment world of ancient Rome looks at the arena as a sporting venue. Wiedemann, Thomas. Emperors and Gladiators (Routledge, 1995). Still one of the best scholarly treatments of gladiatorial games in their broader context, with vivid descriptions of how (and why) they were staged. Wisdom, Stephen. Gladiator 100 BC - AD 200 (Osprey, 2001). A short but lavishly illustrated book looking at the equipment, training, and life of Roman gladiators. Davis, Lindsey. Two for the Lions (Century Books, 1998). This Roman whodunit puts fictional detective Marcus Didius Falco in the world of the ludus to solve a murder mystery. Fast, Howard. Spartacus (North Castle Books, 1996). A novel that dramatizes the Spartacus rebellion by tracing the rise and fall of its leader. It has some very good descriptions of ancient warfare. Mannix, Daniel P. Those About to Die (Ballantine, 1960). A fictionalized look at gladiators, with more about the animal shows than usually shows up. Generally well-researched, but there are still some howlers here and there. Colosseum (BBC, 2003). Despite minor inaccuracies in equipment, this television series about a fictional gladiator's career is well-made and largely true to history. Empire (Thomas Wheeler, 2005). This miniseries is a perfect example of the Hollywood "camp" treatment of gladiators, complete with combat dungeons and daring escapes. Gladiator (Ridley Scott, 2000). While not historically accurate in its depiction of gladiators or their training, this movie is a great inspiration for Hollywood-style gladiators. Spartacus (Stanley Kubrick, 1960). A cinematic version of Howard Fast's novel. Especially notable for its excellent training sequences.